Jas' latest berth is aboard the Galathea, which trawls the reaches of the galaxy seeking precious minerals and rare resources. She thinks it's a routine trip. She's wrong. An inspection of a far-flung planet leaves Jas suspicious that there's more to the place than meets the eye. If only she could convince the captain of the need for caution, but she might as well wish for a tasty meal in the ship's canteen. When the captain disciplines Jas for insubordination, she has only two allies: a timid navigator and the second pilot, who has the hots for her. Not that Jas notices. All hell breaks loose, and Jas' skills are put to the ultimate test. Can she enlist the help of the only two friends she has? She's in a race against time to prevent the aliens from achieving their goal: Generation. If she fails, the ship's crew, the galactic empire, and humanity itself are at risk. 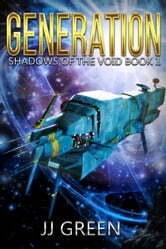 Generation is book one in the fast-paced, action-packed Shadows of the Void space opera. Complete series. Good read. Well written and had me till the end. Looking forward to the next book. It's easy for the Security Officer to be willing to kill people that she thinks have been taken over by aliens. It's a lot harder to expect a navigator or the co-pilot to have the same attitude. Stunning the aliens can only be a temporary solution. Jas is determined to save the people of Earth but doesn't seem concerned about saving the people of the exploration ship - including herself. Despised security officer against nearly the whole crew at an inhospitable and inimical planet. This book sets the scene for more to follow and has caught my interest enough that I want to know what happens next. Good crew interaction and believable enough to read smoothly, although the Captain took a little suspension of disbelief. But the little alien pet was a delight. I liked the characters, interesting plot & action. Will certainly read the next book to see transpires.